This 3 mile out and back hike offered two very distinctive landscapes. Starting from the parking area for Nicholas Farm and passing the red gate, you are immediately walking down a grass covered road that weaves northerly through areas of woods and large open fields. The fields are a haven for insects of all sorts. Grasshoppers, crickets, butterflies, bees, and cicadas were all abundant here. There were also some rather impressive ant mounds along the edge of the road. As the road ends, a narrower wooded trail appears on the right. This trail at first heads northerly toward the Moosup River and then turns to the west as it follows the river up on a ridge. It travels mostly through areas of pines and for the most part, with the exception of one large hill, is rather level. It is unblazed, but for the most part very discernible. At the end of the trail you have reached Connecticut. There is an area to the right to view the river. There is a gravel road that comes from the left and also a gravel trail ahead of you. 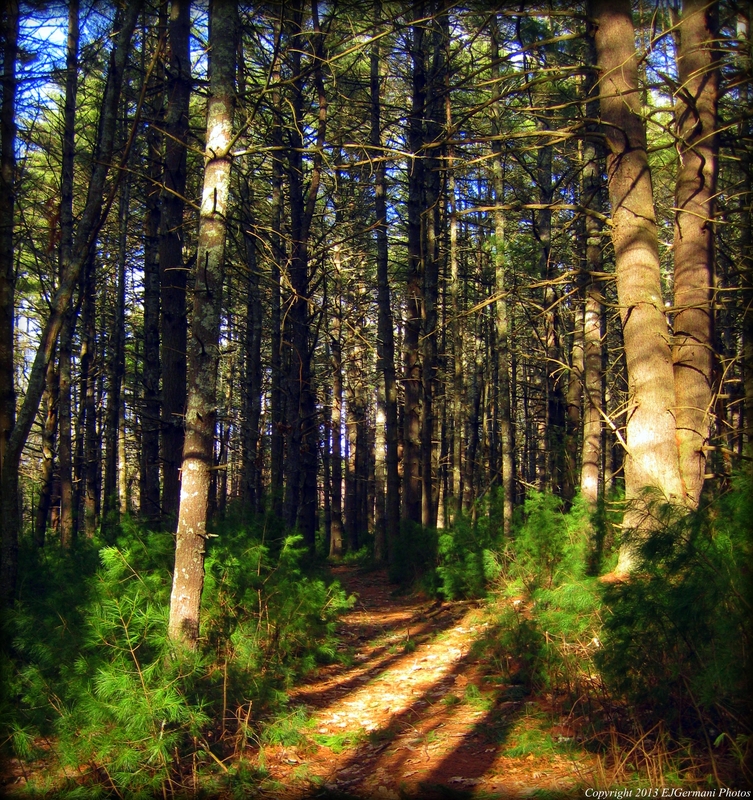 These trails are part of the Pachuag State Forest, are unmarked, and can add miles of walking to your hike. If you choose to, be sure to have a trail map and/or GPS readily available, as the trail network can be a bit confusing. For this hike, I suggest that you retrace your steps back to the start of the hike. Trail map can be found at: Nicholas Farm. A Field At Nicholas Farm. This would be my fourth of five planned hikes in the Nicholas Farm Management Area. This 3 mile loop hike follows two dirt roads through and along the southern end of the property as well as part of the North South Trail. We started this hike by leaving the parking area and back out to the road. From there we headed west about 1/10 of a mile along Nicholas Road to an intersection. We turned left here, passed a gate, and followed the old dirt road named Greenhouse Road. Along this stretch we saw some stone walls and the first of the towering pines. About 3/10 of a mile we came to a slight obstacle. The road was flooded over by the adjacent pond, is pretty nonetheless, and makes for a good photograph. It was obviously the work of beavers. Staying to the left of the flooded area a trail opens up, later rejoining the road, and detours around the water. It has been dry in the area lately. This could become impassable in wetter weather. We then followed the road to its end, passing another gate, and then turned right onto Newport Road. The gravel road winds in a westerly direction and is flanked by old stone walls. Soon a road joins from the left and the blue blazes of the North South Trail are seen on the trees and nearby boulders as we continued following Newport Road. Just before the Connecticut border, a trail turns right into the woods. The trail is blazed blue still and climbs briefly up a hill. An area to the left is currently being cleared for wildlife restoration. There are signs here explaining the procedure. The trail along this stretch weaves through a canopy of tall trees over a blanket of low shrubs. It is rather picturesque. The trail then exits back to Nicholas Road. Here we turned right and followed the road back to the parking area. Pond Overflows Onto The Trail. Spring in New England… I woke early this morning to the sound of a driving rain and sleet against the window. When I left the house the roads were wet with water. By the time I got to Western Coventry the precipitation had stopped but the roads were covered with a layer of snow. Did I mention it’s mid-April? I arrived at Carbuncle Pond before sunrise and the skies to the west were just clearing. Right place at the right time again, as I found myself watching the nearly full moon setting over the pond before I embarked on my morning hike. Following, for the most part, the hike described in Ken Weber’s “Weekend Walks in Rhode Island” I started this hike from the parking area at the dock and followed the road to the second parking area. From here I followed the edge of the pond to another area that looks like it might be used for parking. At the end of this area (opposite the end of a guardrail) a path opens up to the left. I followed this path to its end as it passed a marsh to the right before climbing up an embankment to an old railroad bed. At the top of the hill I turned right and followed it to an area where there was enough clearance to get a good overlook of the ponds below. I then turned around passing the trail that I came in on and a second trail to the left (I would use after retracing my steps) continuing straight along the old railroad bed until I reached a trestle bridge. This bridge spans the Moosup River and there are plans in the future to connect this area with the Coventry Greenway. At the trestle I turned around and retraced my steps and then turned right at the trail that was marked with blue blazes (this is a segment of the North-South Trail). 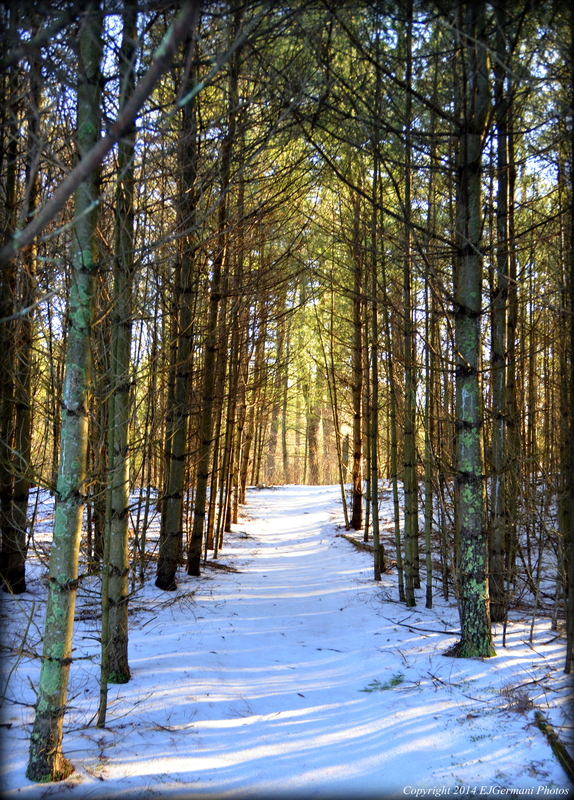 I then followed the blue blazed trail through areas of pine groves and fields. The skies were now just about completely clearing up and the morning sun was casting long shadows through the trees along this stretch. I could only think of a few more beautiful moments. As the blue trail came out a section of woods I came to an intersection in a clearing. There was a pole with a blue blaze labeled “North South Trail”. Keep this pole in mind for the return part of this hike. At this pole I turned right continuing to follow the blue blazed trail as it descended to Spencer Rock. This is where the Moosup River cascades over a rock formation making for a waterfall. I was here last year, but on the other side, on the much lesser known Perry Farm hike. Today the water was rushing through here much faster than I’ve seen it before mainly due to the amount of rain the area had last night. There were actually flood advisories in the area overnight. 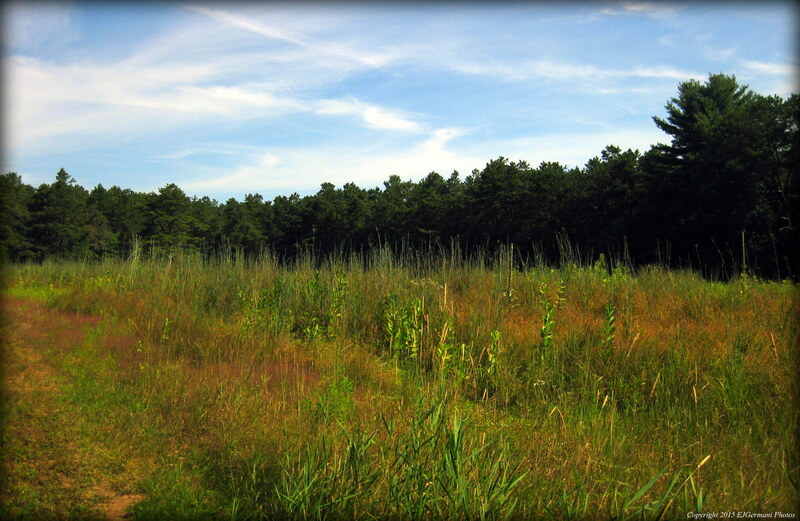 After lingering for a bit I continued along the blue blazed trail through thick pines and into another field. At this field there is a very faint trail. In the event it is not visible the trail continues at the opposite end and the left of the field. There is a pole marked with a blue blaze there. The trail continues through more pines and the path narrows quite a bit for a small stretch. As the path descends downhill start looking for a field on the left. The blue blazed trail continues straight to the road. At this field I left the trail and followed the left tree line of the field up to a dirt road. At the dirt road I turned left and followed it to its end. I missed the turn described in the Weber book, however, with a good sense of direction and checking with the GPS I found an alternate route easily. At the end of the dirt road I had noticed the blue blazed North South Trail marker pole I mentioned earlier. If I were to go straight, I would end up back at the railroad bed. If I were to go left, I would end up back at Spencer Rock. So I went right for a few hundred feet before the path split into a three way fork. I followed the path to the right straight down to the road between the first and second parking area. I turned right at the road and followed it to the car. I did not come across much wildlife here other than many birds of all sizes. I did see deer and possibly fox tracks here. 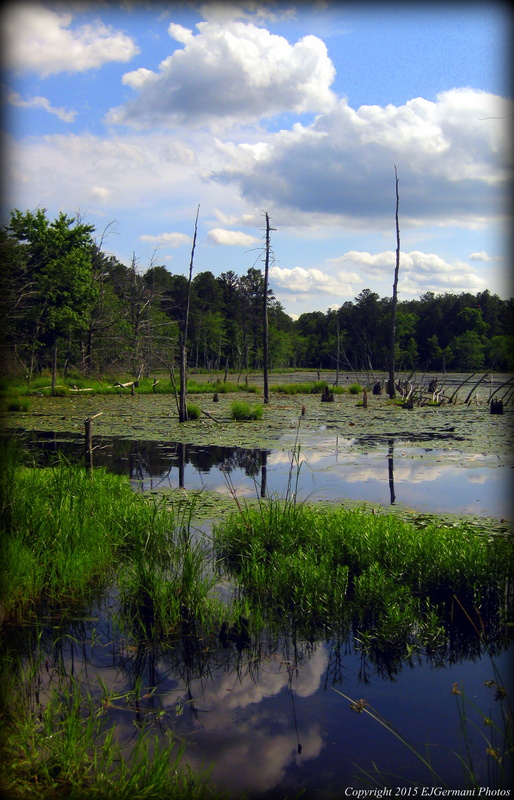 Trail map can be found at: Carbuncle Pond. Easy with some difficult navigation at beginning and end. The most challenging aspect of this trail was the first section. I was using a trail map from a twenty year old book. The first challenge was finding the trail head as there is no signage for it. It is exactly two tenths of a mile south of the intersection of 117 and 14 along Flat River Road on the right. It is just to the left of a fenced area for cows, to the right of utility pole 666 (not as bad as it sounds) and near a stone wall. After finding the trail-head as described in the book the second challenge was storm damage and debris presumably from this winters blizzard. I found myself climbing and crawling over and under a few down trees. The next challenge of the first section came towards the end of the hike. Finding it again to leave. With all the storm damage, minimal use, and lack of blazes, this proved to be difficult. Unless you know your direction pretty well I would suggest using a GPS unit. The first section is a couple hundred feet long and pretty much follows a stone wall on the right and crosses a couple others. The cows in the adjacent fenced in area seemed very curious to my presence. After the first section was completed Perry Farm became a very nice hike and well worth trekking through the first section. At the end of the first section an old cart-path opens up. I followed it to the left and was immediately greeted by six deer. The rest was easy and simple. 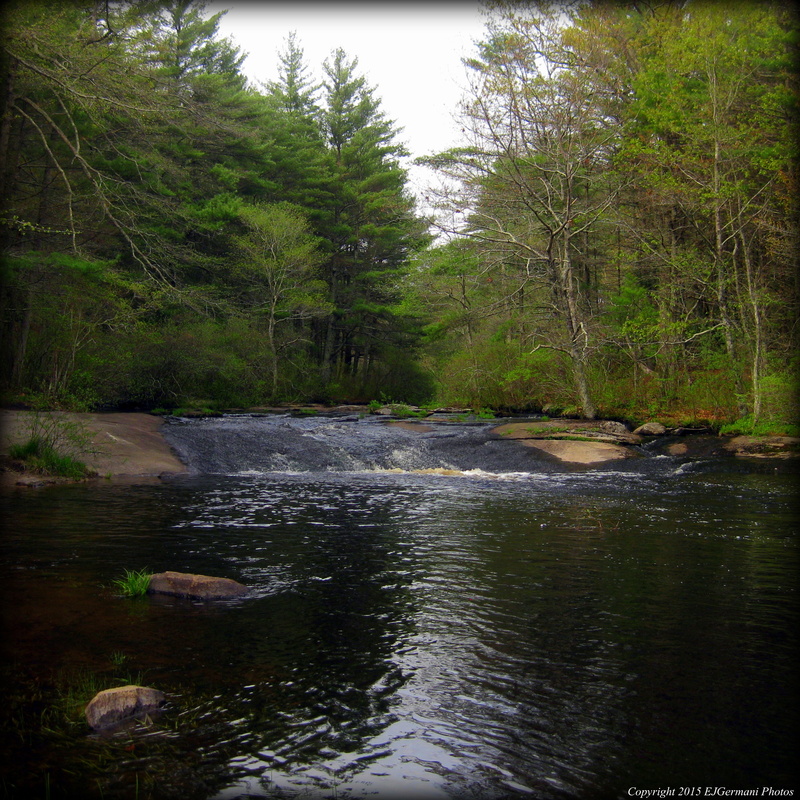 It led me past a small pond on the left then through some very dense wooded pines and finally ended at the Moosup River at what is known as Spencer Rock, a series of small waterfalls. On the way back I followed a path that went around the other side of the pond. It is not marked at all and the only way that I knew it was a path was by the brush-saw marks along the way. Again without a GPS unit you could easily end up elsewhere. I would suggest just staying on the main path. Unfortunately, I think its going to be a bad tick season this year. Checking regularly, I had up to a dozen ticks on me along this hike. I suspect mostly from the first section.